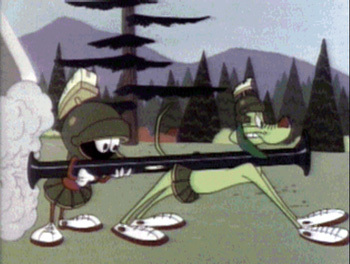 Marvin the Martian. Warner Brothers' greatest character (IMHO) and perpetual failure. 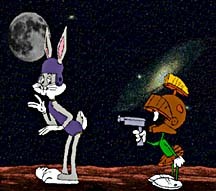 He's been trying to get rid of that annoying earth and that pesky eathling Bugs Bunny for as long as I can remember. Somehow, every time he manages to catch that rabbit, he gets away. Maybe someday he'll finally take care of him once and for all. Here's some more Marvin clipart that I have collected. He's certainly better than Bill Clinton, Al Gore, Bill Bradley, <insert the name of any Democrat here>.